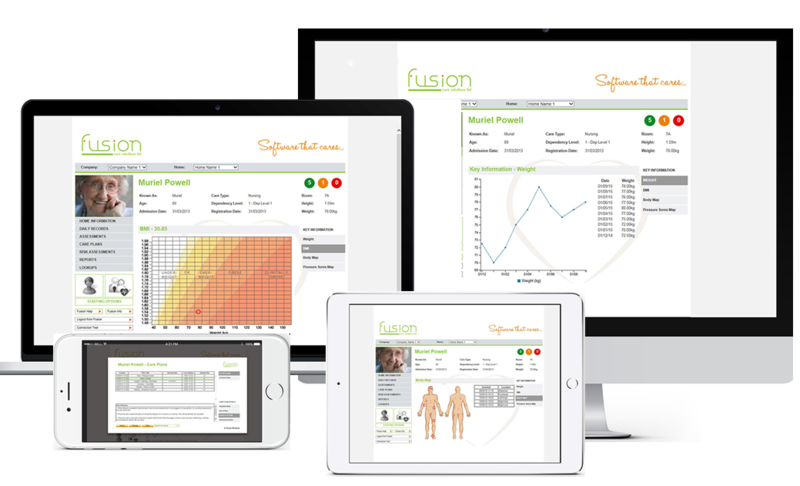 True synergy in the care industry with Fusion. Looking after your residents comes with many different restrictions and guidelines – directly from your residents, from their loved ones and then from the regulatory bodies, the main one being the Care Quality Commission (CQC). Delivering care day after day with an ageing population in an environment, where care only becomes more and more complex the longer people are living, can put you in a compromising position as you try to juggle what you want to do with what you need to do and what you have to do. How can you bridge the gap between cost-efficiency and care? The solution lies in your technology partner. Cloud communications, storage and mobility deliver highly personalised levels of care and with robust and reliable communications that you can scale to your needs and that keeps data safe and secure. There’s been a strong emphasis on data security in the recent year and – with strict GDPR regulations on data usage now in operation – cloud communication means that only permitted persons have secure access to your data and that you can ensure that it is only being used as it should be. Cloud-based communications allow for streamlined processes that happen in real time and allow access to medical files from where and when it’s needed, rather than simply in the administration office. This means that medical staff can make properly informed decisions about care without distraction or delay. Using the same technology, decisions on care can be shared out to family members or caregivers, closing the loop in the care circle. Healthcare had been ruled by a series of face-to-face meetings, letters and telephone calls. By focusing on your interconnectivity provision you can create seamless workflows and communication streams that connect your smart devices to the internet. This could be a game changer for the care industry. By being able to work with people in their own homes, it could mean that they’re able to livestay independently yet be supported by the care industry. It could relieve the pressure on people looking for places in residential care homes without leaving them to care for themselves, enabling them to maintain their independence. How much time could you shave off your working week if you could attend meetings from your own office? The world is moving away from the notion that video calling, such as Skype and Google Hangouts, is second best. Rather the modern world revolves around meetings that take place without people ever sitting in the same room together – and the work still happens as it ever did. Travel time and costs are slashed because you simply don’t have to travel to talk any more. Not only can you meet with other professionals, such as social workers but you’ll be able to drop in with those who want to preserve their independence and remain in their own homes as well as making it easier to get everyone in the family sitting around the same table, albeit in different locations. What difference could it make to know that you were at the end of a Skype call if needed? It would take the stress out of appointment setting and the pressure off the NHS. At Fusion Care Solutions, we combine decades of experience in the care sector with the latest advancements in technology to produce innovative and user-friendly Care Management Software that will significantly streamline your administration processes, it’s also been proven to boost your compliance ratings with CQC. To find out more about how Fusion Care Solutions can help boost your communication, resident/relative satisfaction levels and enhance your compliance – simply fill in the short form, and we’ll do the rest.